Regularly lubricate all moving parts. It's essential: you must oil all moving parts every year. Apply lightweight oil to roller and hinge pivots; apply spray-on white lithium grease to the opener's chain- or screw-drive; and a cleaner-lubricant to the springs. Go easy, though because too much oil will collect dirt. Clean tracks by wiping them with a cloth dampened with oil. Follow your owner's manual if its instructions differ. Test your garage-door opener's auto-reverse safety feature every month. Next, place an item flat on the ground in the door's path, and hit the remote again. The door should instantly reverse as it touches the item. If it doesn't, increase its close limit by following the guidelines in your owner's manual. Pull the release cord or lever to disconnect the opener. You should now be able to lower the door halfway and have it hold position, with only a slight movement above or below the halfway point. If the door rides back up or falls, have a pro adjust the spring tension. 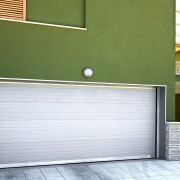 You can extend your garage door's life by protecting its surfaces from dirt and corrosion. Dust the door both inside and outside. Then wipe it down with a mild household detergent in water. Spray lightly with a hose to rinse off any remaining detergent. 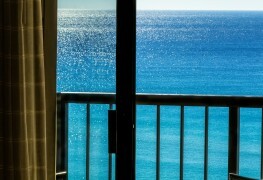 If the door is metal with an enamel finish, apply car wax on the exterior to seal out damaging grime and moisture. 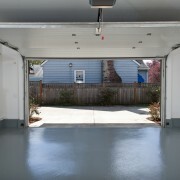 A garage door's weight is counterbalanced by either a torsion spring mounted on the header above the door, or a pair of side-mounted extension springs above the roller tracks. These tightly coiled springs can injure you if they snap or come loose. If they need adjustment or replacement, call a garage door installer. Always have both springs in a pair replaced. 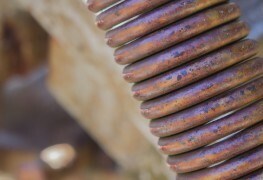 Also call a pro if the lift cables – attached to the bottom bracket – are frayed and need to be replaced. Water splashing on the bottom of your garage door will eventually cause problems: rust on a metal door or peeling paint and rot on a wooden one. Make sure that your gutters keep water away from the door and that the surrounding landscape doesn't drain water onto the drive in front of the door. Clear away snow before it melts and refreezes, sticking the door to the driveway. Every two months, wipe the weather stripping around the edges of the garage door frame and along the bottom of the door with vinyl cleaner. Then spray with silicone lubricant to keep it pliable. This also helps keep the bottom seal from sticking to the snow. Why do kids think garage doors are the perfect backstops for batting practice? 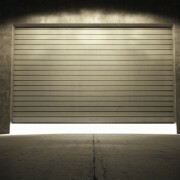 Balls can dent a metal door and cause any garage door's parts to loosen or become misaligned. It's not a smart idea to put a basketball hoop over the door either. When working on a garage door, open it and disconnect it from its power source. Remember to also place C-clamps or locking pliers on the track above and below one of the door's rollers to lock the door in place – this is much safer than propping the door open. 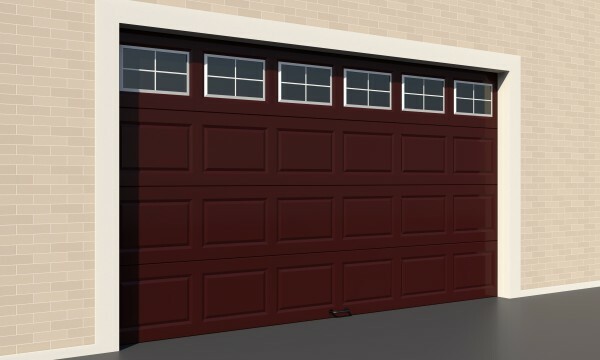 For whatever purpose you use your garage, to park your car or to store anything that doesn't fit in the house, chances are your garage door gets used a lot. With a little regular maintenance, there's no reason it won't give you trouble-free access to your garage for years to come.